wire them together in a particular way. If you look inside an existing wired in two way switch you will see quite a few wires of differing colours. This can be confusing. 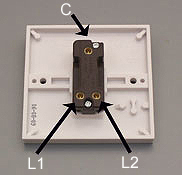 One thing to remember is that the wiriing on light switches is ONLY switching the live wires (NOT the neutral.) If you see black wires or blue wires attched to the switches these are not neutrals. Those wires have just been used for convenience. If done properly they should have a coloured sheath on them to indicate a live wire. N.B. For simplicity the earth wire is not shown in the above diagram. Your lighting circuit must have an earth cable terminating in the switch back box, and also at the switch plate if it is metal.